With blockchain coming into the spotlight, the need for talent in the field has never been greater. As companies compete to attract the best and brightest, many are left wondering how they can spread awareness of their businesses. 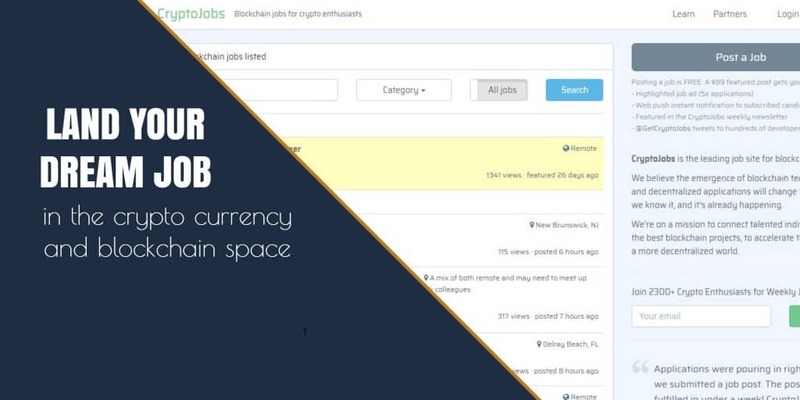 CryptoJobs is a place where companies can list the jobs that they have that are specifically targeted at employees looking for jobs relating to blockchain. By using this tool, companies are able to target talented employees who are looking for the exact jobs that they are offering. The tool works very similarly to a traditional job posting service with the caveat that it is specifically targeted at a particular audience. By using this tool, several businesses have been able to greatly increase the number of applicants that they get for a job, allowing them to be more selective. This increase in selectivity ensures that they will get the best fit for their job rather than have to settle for an inferior candidate. The tool offers the ability for applicants to filter based on what type of job they are looking for (marketing, development, sales, etc.). Job listings are organized by relevancy and length of time posted. The layout of the tool is very organized and easy to use. If an applicant has a specific job in mind, they can use a search bar to find the listing they are looking for. In addition, there is an emailing list that applicants can subscribe to. This list allows businesses to more easily get the word out to potential applicants that they have an opening. In addition to job type, potential applicants can easily screen for location to make sure that they know where the job they are applying for is located. Finding the right applicant for a job boils down to numbers and quality. CryptoJobs is able to address both of these because it targets a large audience interested in a specific topic. With blockchain stepping into the limelight, there will only be more and more competition over time to attract talent. Businesses using CryptoJobs will have an edge in getting that talent because of the exposure the tool offers.